(Lanka-e-News - 01.Jan.2018, 11.30PM) Though the constitutional crisis that arose from the conspiracy hatched between the President and Mahinda Rajapakse which brought the country to the brink of civil war has ended due to the Supreme Court interpreting the provisions of the constitution on the dissolution of Parliament, the political crisis that emerged out of it has not receded. The Supreme Court has held that the President cannot dissolve Parliament within the first four and a half years of the life of Parliament unless Parliament by a resolution passed with 2/3 majority request that Parliament be dissolved. The removal of Ranil Wickramasinghe from the office of Prime Minister, appointment of Mahinda Rajapakse as Prime Minister, prorogation of Parliament and, dissolution of Parliament by the President were in violation of the Constitution. Under the Constitution the President has no power to remove the Prime Minister. Article 42(4) mandates the President to appoint as Prime Minister the Member of Parliament who in his opinion is most likely to command the confidence of Parliament. The wording “in his opinion” does not give the President an absolute discretion to make an appointment not based on the ground situation. The discretion has to be used with objectively. In any case once he uses his discretion and appoints a Prime Minister his discretion ends there. Thereafter there is no provision enabling the President to remove the Prime Minister. The Prime Minister ceases to hold office only under the circumstances specifically set out in the constitution. The President can appoint a new Prime Minister only when the Prime Minister ceases to hold office under the constitution. Under Article 46(2), the Prime Minister shall continue to hold office throughout the period during which the Cabinet of Ministers continues to function under the constitution. The exceptions laid down in Article 46(2)(a) is where the Prime Minister resigns his office and Article 46(2)(b) where the Prime Minister ceases to be a Member of Parliament. The other circumstances where the Prime Minister will cease to hold office will be under Article 48(2) where Parliament rejects the Statement of Government Policy or the Appropriation Bill or passes a vote of no confidence in the Government. Therefore the action of the President in removing the Prime Minister and appointing Mahinda Rajapakse as the Prime Minister is an intentional violation of the Constitution. The next step in the process, the prorogation of Parliament is a violation of the spirit of the Constitution. The President is vested with the power to prorogue Parliament under Article 33(2)(c). This Article confers the general power of prorogation. But the purpose for which this power is vested in the President is governed by conventions. The word “prorogation’ itself in a Parliamentary system carries with it what it means. Under the British Parliamentary conventions, which we follow, Parliament is prorogued either to give the members of Parliament a recess or to clear the order paper of Parliament when it is full of motions that has not been disposed of so that the House can commence the new sessions with a clean slate. The tradition even in our Parliament is for Parliament to be prorogued on the advice of the Prime Minister. If the power to prorogue Parliament is given a wide meaning to mean that the President can prorogue Parliament at any time for any purpose, the President would be able to make use of this power to trifle the functioning of Parliament. Such an act will violate the sovereignty of the people. The President prorogued Parliament when Parliament was about to consider the appropriation bill. Obviously the President prorogued Parliament to enable Mahinda Rajapakse to get the support of 113 Members of Parliament. How he was expected to find the numbers was reveled later by the President himself when he said that Mahinda Rajapakse failed to show the support of 113 Members because Members of Parliament has raised their price to over Rupees five hundred million. Therefore prorogation of Parliament admittedly was for an illegal purpose. This again amounts to an intentional abuse of power in violation of the Constitution. Thereafter, when the Mahinda Rajapakse government was short of the number necessary to function in Parliament the President dissolved Parliament, This is a blatant intentional violation of the constitution. This is confirmed by the judgment of the Supreme Court. Announcement by the President that he will not appoint Ranil Wickramasinghe as Prime Minister even if all 225 Members of Parliament request him to do so is a threat to act in violation of the constitution, as it is clearly laid down that the President has to appoint as Prime Minister the Member of Parliament who has the confidence of majority of members of Parliament. This too is an act of intentional violation of the constitution. 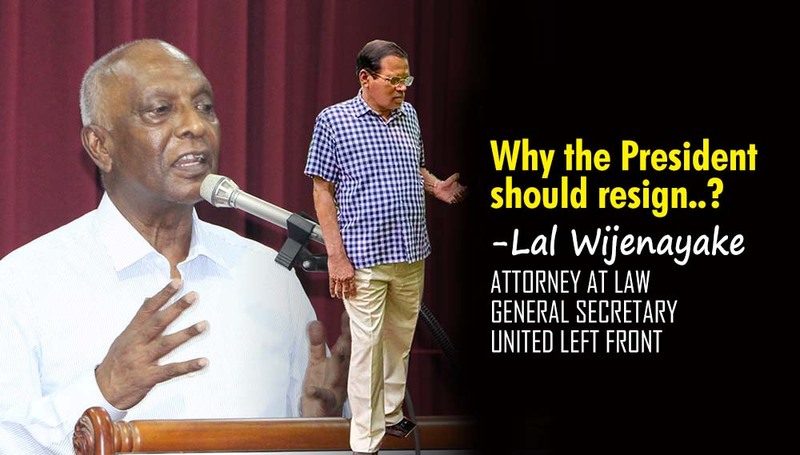 The President claims to be the leader of the UPFA. UPFA claims that they be recognized as the main party in the opposition and demands that Mahinda Rajapakse be appointed as the leader of the Opposition. On the other hand the President holds three ministries Defense, Environment, and Mahaweli Development as stipulated in the constitution and has also kept under him the Ministry of Law and Order and some Media Institutions. Therefore the President is the head of the main opposition party, holds Cabinet Ministries and chairs Cabinet meetings as President. There is clearly a conflict of interest. This is a blatant violation of the spirit of the Constitution. Therefore the President has no moral right to continue to function as the President. His continuing to hold office is an obstruction to the smooth functioning of the Government. Therefore the President should resign from the position as President and allow the country to be governed upholding the Constitution.